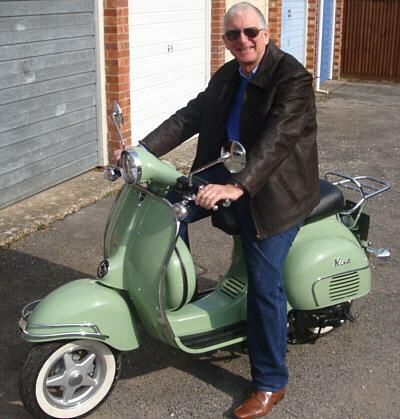 I solved my mid-life crisis with this great retro-styled scooter which I first saw reviewed in Classic Scooterist Scene. 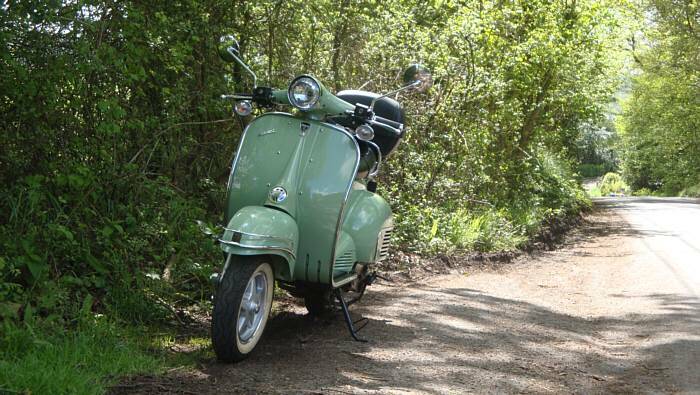 It's constantly being mistaken for a 1960s classic Italian designed Vespa; it's actually a new Neco Abruzzi. 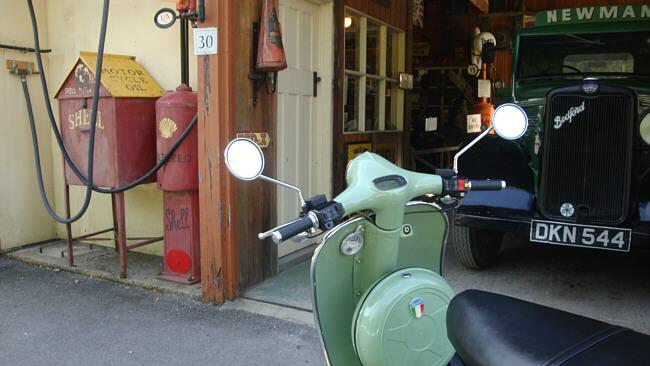 The spare wheel holder if a fake - it's a very useful lockable storage space. 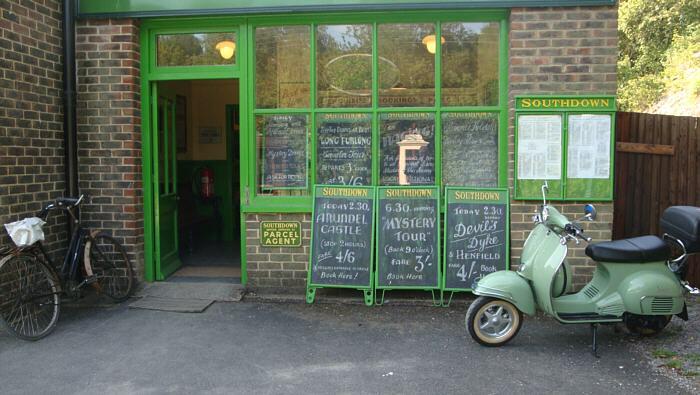 I thought I'd take some photos around Sussex with backgrounds that could easily be back in 1960! Enjoy. 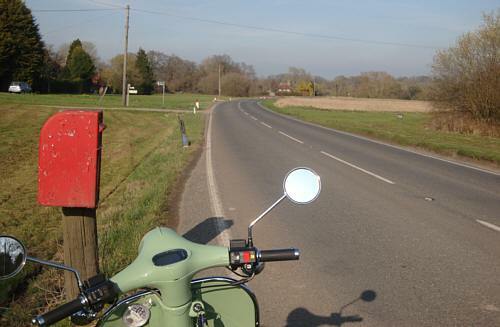 Between Partridge Green and Ashurst on Bines Road. A lovely early Spring Day. Ready to continue the journey with a clear road ahead. I've seen a few traditionalists on the web scornful of the Neco. 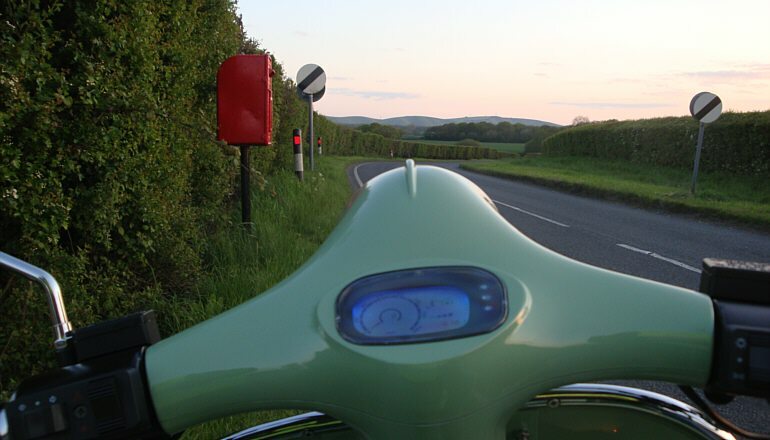 I've also had some complimentary comments when riding and also from motorbike enthusiasts online. Bernhard Ernst from Germany for example would like one but apparently they are not on sale there. The peaceful village of Blackstone, east of Henfield. 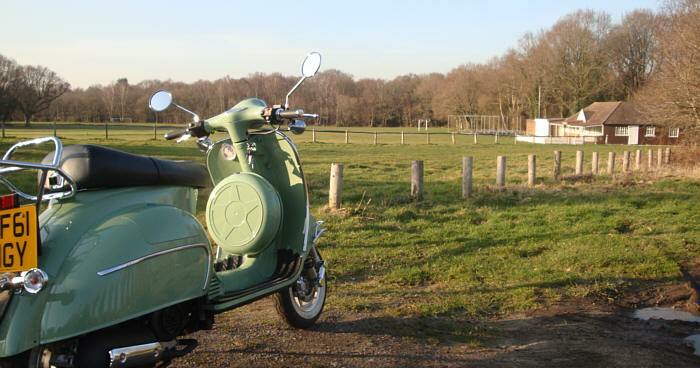 My scooter is only 50 cc but 4 stroke and is not too noisy so should not disturb the peaceful evening! Another peaceful village and an unchanged view of the pub at Slaugham. I thought I would test the bike up some hills. 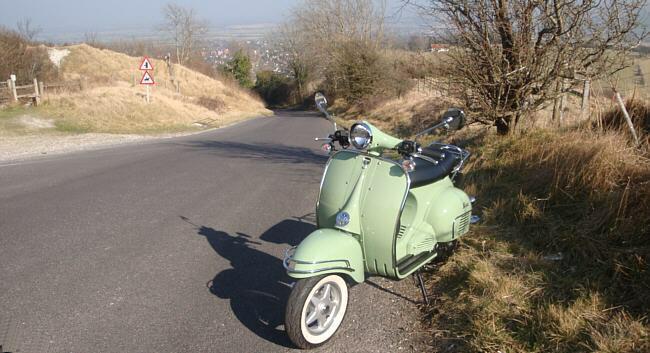 This trip was to the top of the South Downs on the Bostal Road - in the background is Steyning. No problem making it to the top and a great view! And across the river the disused cement works. The chimney is still used as a navigational aid by planes landing at Shoreham Airport. The cricket ground at Henfield. 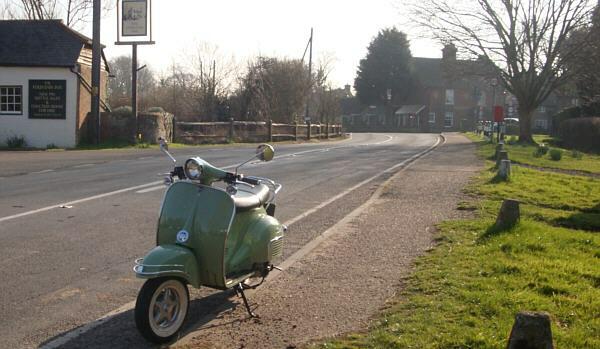 The Fountain Inn at Ashurst. High Beeches garden between Handcross and Crawley Down - well worth a visit. I've bought a chain to keep the bike secure (just in shot on the front wheel) They are widely available, for example from Amazon. For a couple of pounds you can also get a lock that fits over the bike's brake disc - useful for when you don't want to carry the heavy chain. 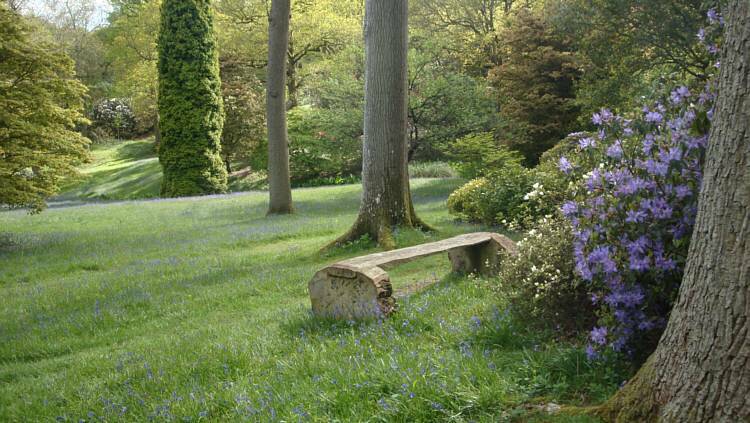 High Beeches garden in early May with the blue bells in bloom. On a trip to the beautiful National Trust Nymans Garden, I stopped for these photos of Staplefield which is a mile of so south. Cricket is played on this green. 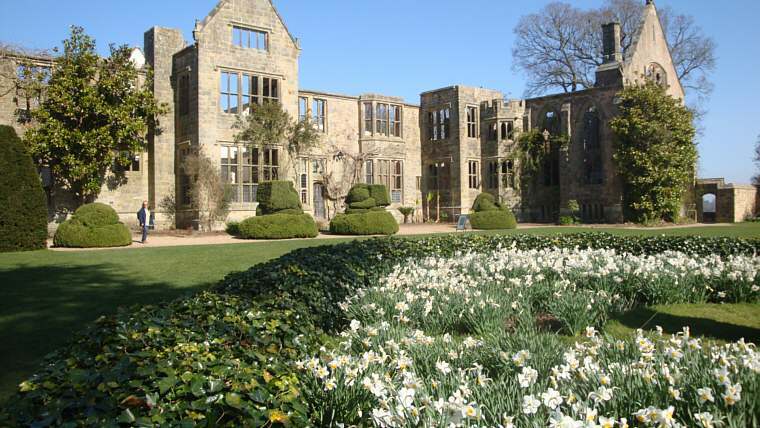 The garden is just up the hill towards Handcross; it was a fantastic day and Nymans garden looked almost as good as the bike. 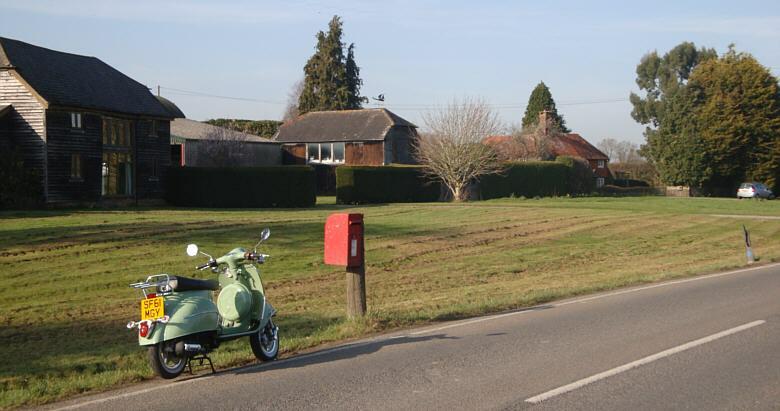 Between Wineham and Warninglid, the finger post sign could be back in the 60s. A little further down the road. Note, I have added a small (26 litre) topbox. It's just big enough for my helmet and more importantly will keep a 3 or 4 person curry or pizza warm for a mile or so on the way home although the papadom may need to be split in half! 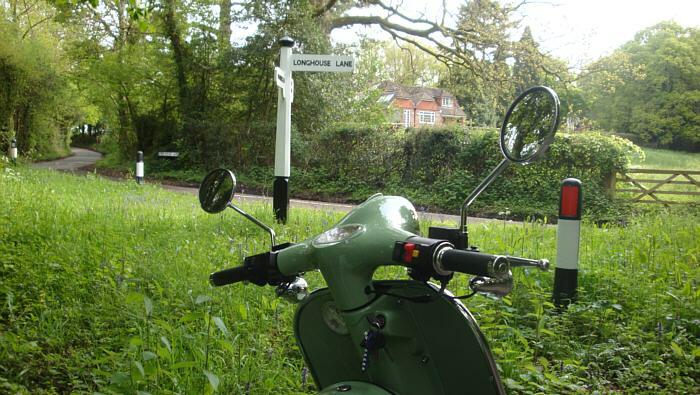 The one i've linked to costs just over � from Amazon and is a doddle to fix to the bike's rack. After lots of rain everything is green. 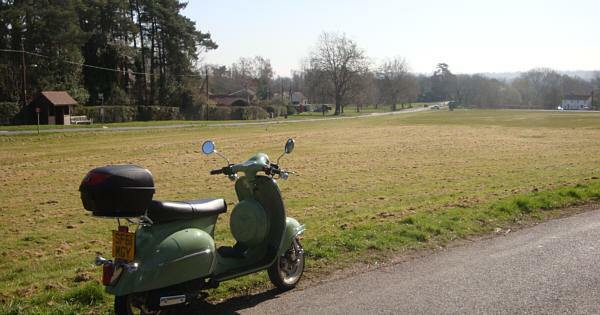 A peaceful spot near Ardingly. The bike starts first time even in the snow and ice. I have a small solar panel (� from Amazon) connected to the battery during the winter. It works a treat! 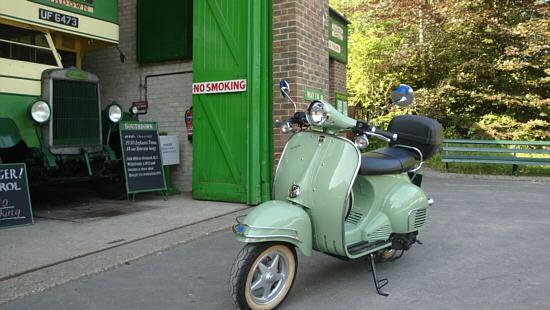 When not riding my Scooter, I am often on the rota as a volunteer driver of the vintage buses at Amberley Museum. 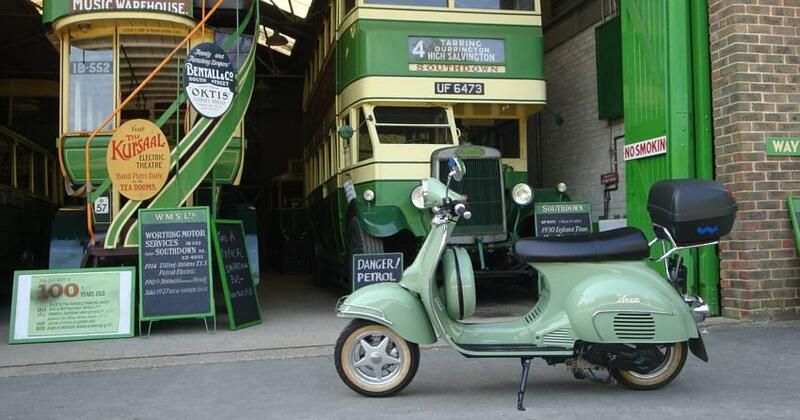 Of course, in the 1950s and 1960s it would have been common for drivers and conductors to ride to the depot for their shift on a scooter or motorbike. This picture really does look authentic and could be from 60 years ago! 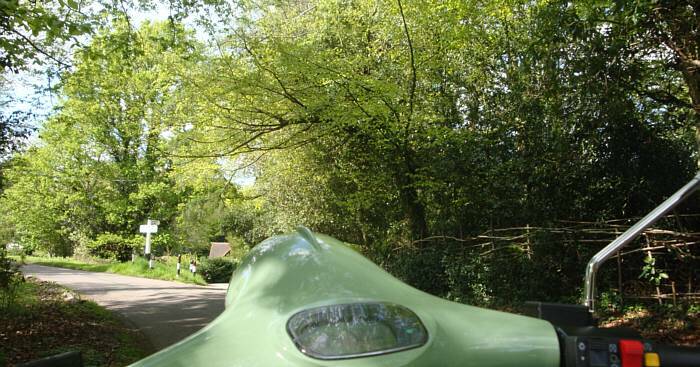 The following dozen or so pictures were all taken at Amberley Museum. 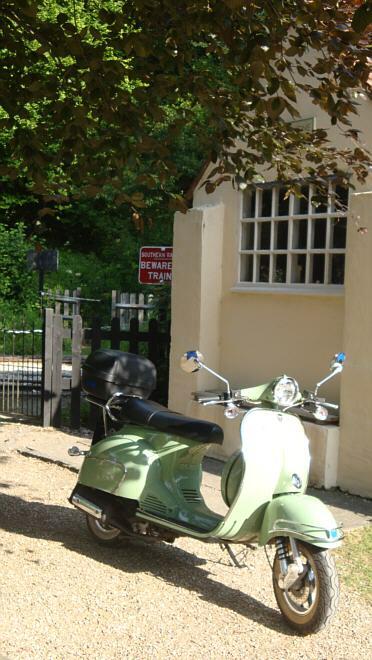 Most of the exhibits and buildings are local and seamlessly fit in with the theme of a ride around Sussex. 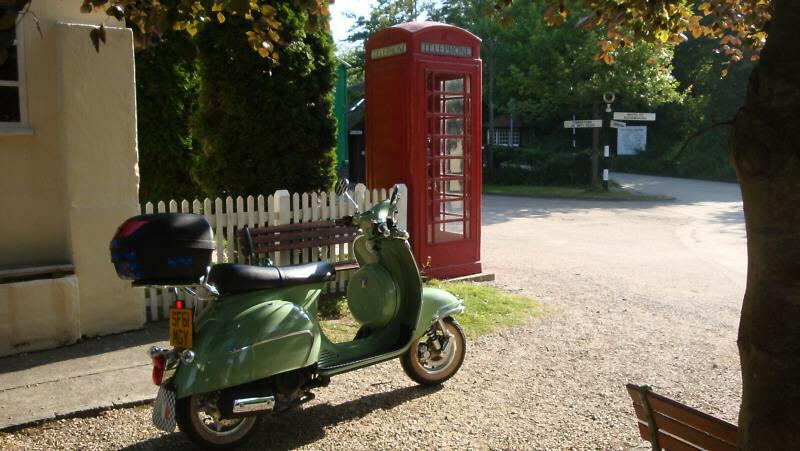 A view of the bike outside the Bus Garage containing many fine vehicles, all in working order, the oldest, a petrol-electric Tilling Stevens (in the left of this photo, registration IB 552) over 100 years old. 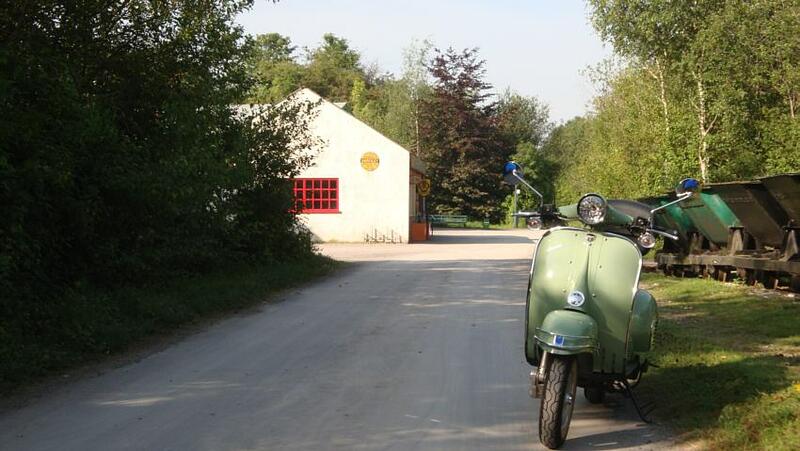 Perhaps too early, even for a Vespa? In any event it's 102 years older than my Neco! The country garage with Bedford van. 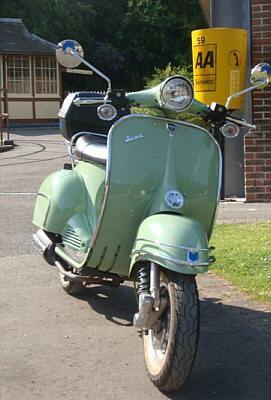 Veteran and vintage vehicles (including motorbikes) can be seen at the museum on 'special' themed days. 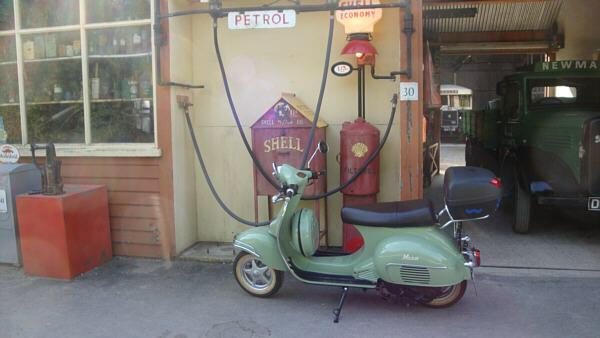 Time to fill up? My Neco averages 110 miles per gallon (measured over the first 2000 miles) so not much profit for the garage owner. 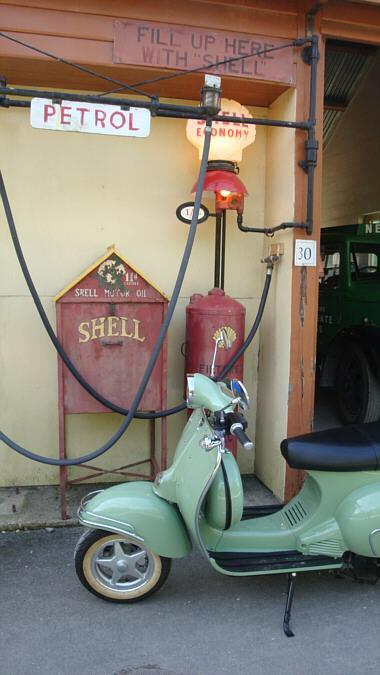 Another fine view of the country garage with Mobil, Dunlop and Shell branding. 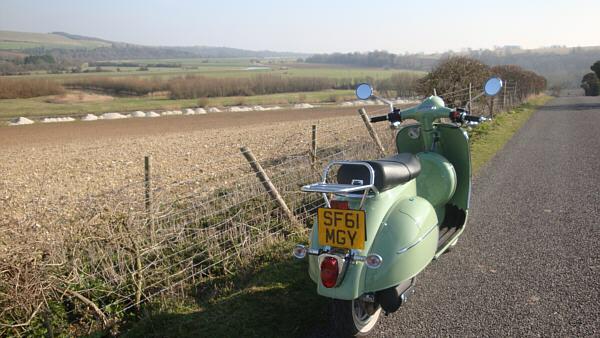 The retro Neco looks entirely at home in this view. Still early morning with a hint of mist, the Bedford van can be seen in the garage and behind, a a single-decker bus from the 1940s. 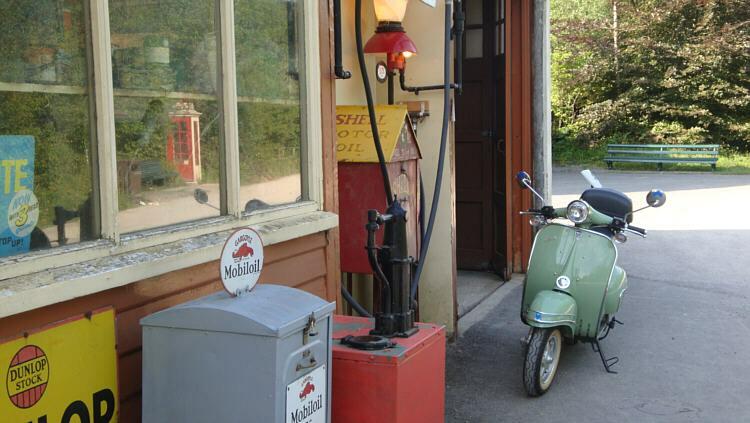 Amberley's industrial railway was the set for much of the James Bond film, A View to a Kill starring Roger Moore and Grace Jones. 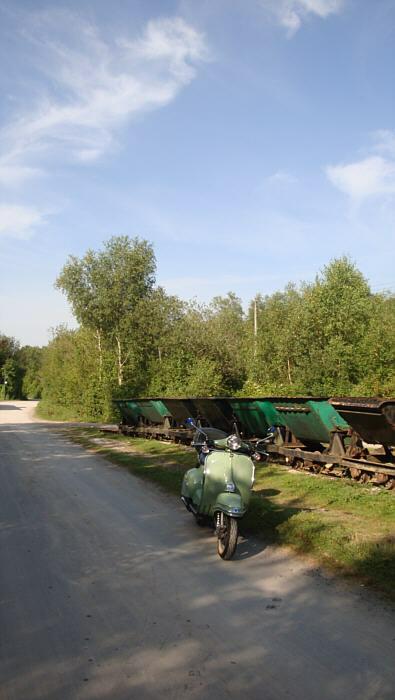 A close inspection of the green wagons shows a 'Z' on each. The Z was for Zorin, the evil criminal featured in the film. The tunnel used in the film (the mine entrance) is a few hundred yards away. 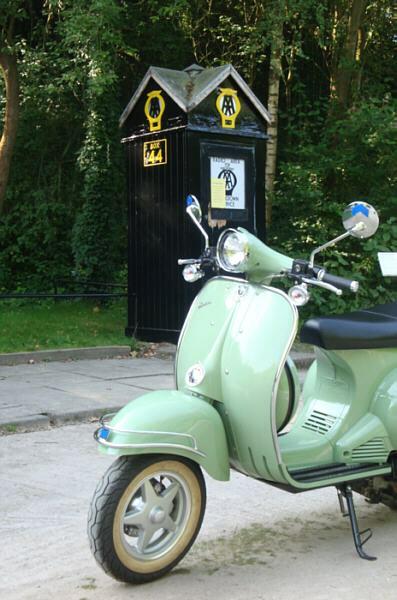 A view of the scooter, the garage and, to the right, the railway sidings. 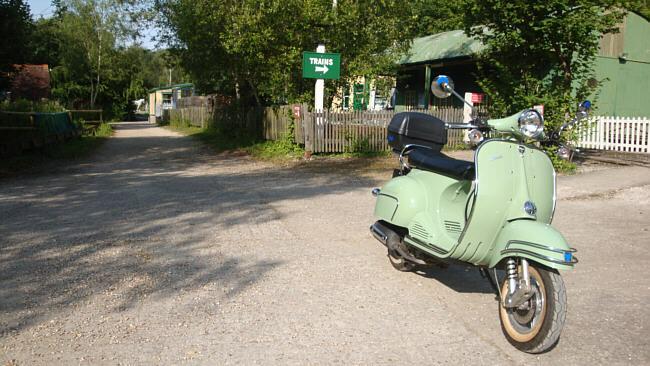 Brockham station (Amberley), railway and Neco scooter. Another view of the points lever and crossing. To the right of this picture, the railway branches into the tunnel mouth used for the James Bond film. Near this spot there used to be a 'three way' point. Quite a complex arrangement even for this guage of railway. It was moved during a track re-alignment. This AA emergency phone box looks typical of the 1960s or probably 1970s. An earlier style of AA box. 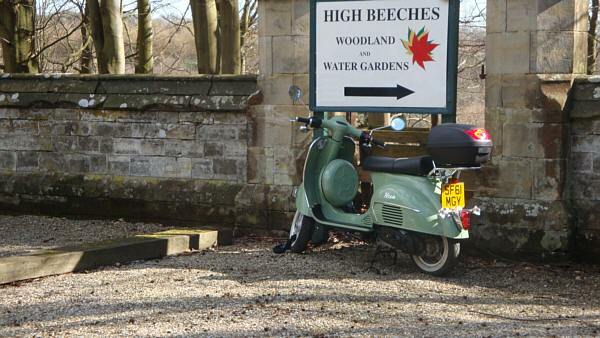 Luckily my scooter has not had need of any form of rescue! 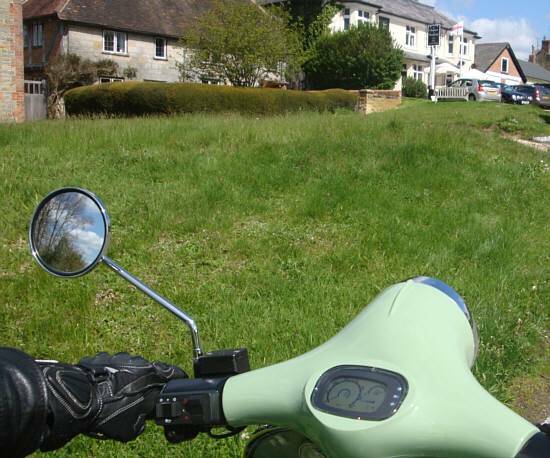 I've done 2,500 miles at the time of writing this and the bike has been totally reliable (except for trim bolts working loose and falling off). 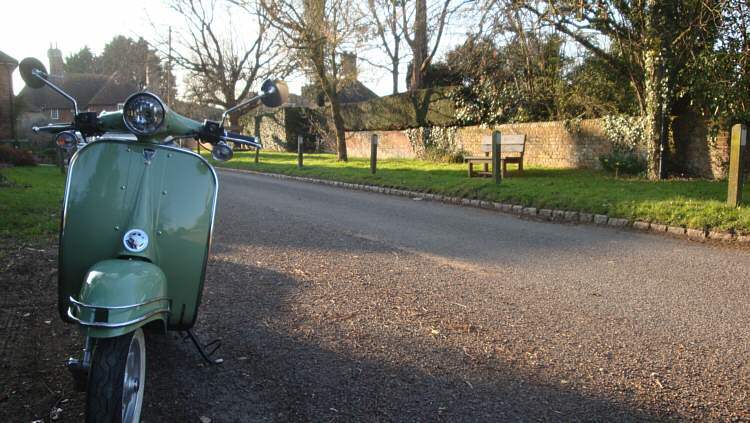 I have kept the bike serviced with gear and engine oil changes as specified by the manual - and there was a lot of gunk that came out with the spent oil so it's probably this that has kept it reliable. I've added a page describing the routine maintenance and light bulb changes I've done. 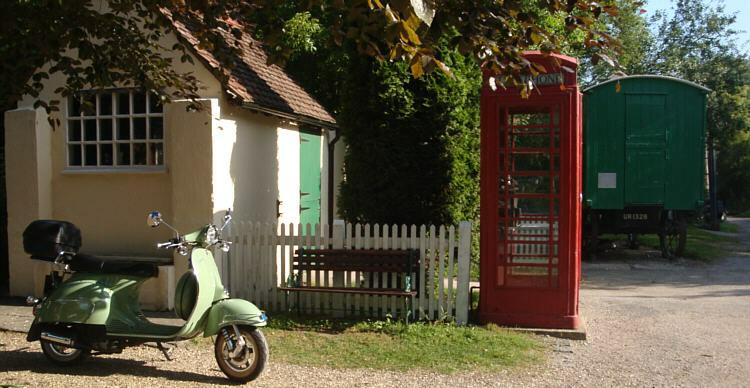 Lots of retro interest here; the lovely old red phone box, the steam roller trailer and the village telephone exchange. Oh, and the Neco! The railway is in the background; the building is the local telephone exchange, an old mechanical exchange still used to link the couple of dozen lines to various buildings across the museum. 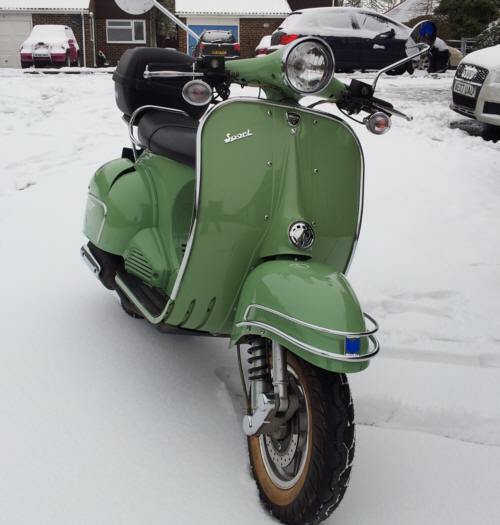 For other scooter owners who find this page, I have added some tips on basic maintenance for a Neco Abruzzi some of which is not covered very well in the manual.